Posted on May 27, 2015 at 5:06 pm. PROVO — Graduations and end-of-year parties are more than expected this time of year, which to the Utah County Sheriff’s Office means more underage drinking and more accidental deaths. Tuesday morning, the Utah County Sheriff’s Office proclaimed the rest of the month to be “Alcohol-free Graduation Week,” and to do so, deputies’ vehicles will display a sticker over the back door that reads: “Seat reserved for adults who give alcohol to minors.” Richard Nance with the SMART coalition said there are more “unfortunate alcohol-related accidents” during graduation than any other time of year. “We’re very fortunate when compared to other states, but we feel this is still very important to the safety of our teens,” he said. “They don’t understand the liability they carry if one of those kids goes out and gets in a car accident, or, heaven forbid, their child becomes a victim of a sexual assault,” Tracy said. Providing alcohol to a minor is a class A misdemeanor and the stickers on the vehicle are intended to show the deputies’ austerity and commitment to that law. Sgt. 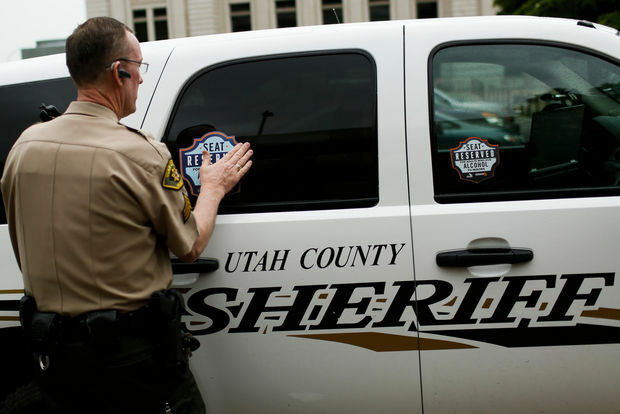 Spencer Cannon of the Utah County Sheriff’s Office said at various times during the year, they place a special focus on laws such as drug- and alcohol-related laws or seatbelt laws, as was the case this weekend.